The identity has been designed for MRSN contest (organized in 2015 by Museo Regionale di Scienze Naturali, Torino) to accompany the architectural proposal of Studio Architetti Deabate. The project involves the reuse of historical spaces inside the museum, through a transparent polyhedron in one of the courtyards, from which visitors can easily access to the different areas. On the right: the architectural project by Studio Architetti Deabate. 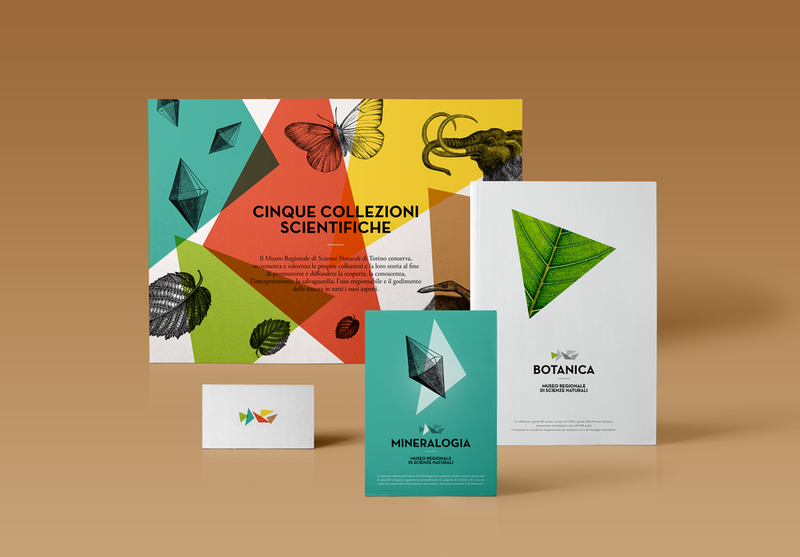 The five triangles ideally represent the five museum sections: botany, entomology, mineralogy, paleontology and zoology. A different color has been selected for each collection, so to have a diversified and bright palette. As a further element of recognition, the sections are depicted through images and illustrations, to be used on deliverables. The logo is suitable for dynamic applications, allowing to identify the thematic itineraries through video animations, suggesting the way to achieve the dedicated area.